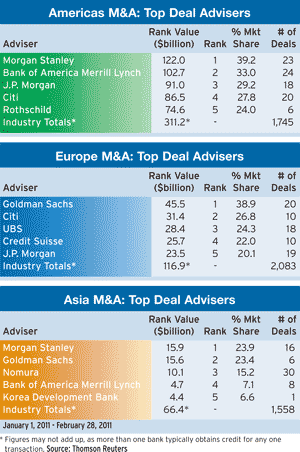 The energy and financial services sectors were expected to be fertile ground for mergers and acquisitions in 2011, and so far they are living up to those expectations. 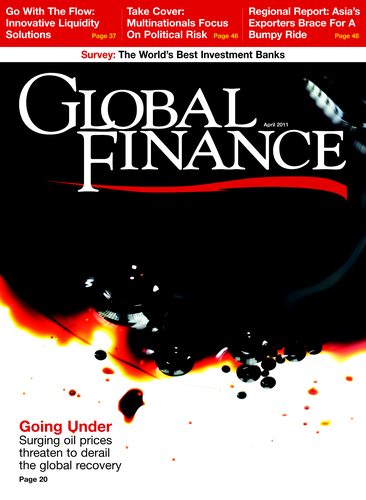 Rising oil prices, geopolitical and sovereign-debt problems and fallout from the financial crisis are keeping both areas in flux. Cash-laden companies, including many in emerging markets, are eager to acquire domestic and cross-border rivals at reasonable prices. China, in particular, has been aggressively buying major stakes in foreign companies that control energy and natural resources. PetroChina International Investment agreed to pay $5.4 billion to form a 50-50 joint venture to develop shale-gas production with Alberta, Canada–based Encana. The agreement involves 1.3 million acres of land in the Cutbank Ridge, with a processing capacity of 700 million cubic feet of gas per day, as well as thousands of miles of collection pipelines and underground gas-storage facilities. Petro China says it has been looking for opportunities to work with major Canadian oil and gas companies, in areas including LNG and oil sands in Canada, and on projects in China. Meanwhile, Abu Dhabi, the largest oil-producing region in the United Arab Emirates, has gained a foothold in the European refining and petrochemicals industries. International Petroleum Investment Company (IPIC), the sovereign wealth fund of the Abu Dhabi government, agreed to pay $7.2 billion to acquire the remaining 52.9% interest in Spain’s second largest oil company, Cia Española de Petróleos (Cepsa), from Total, the France-based oil company, and other investors. As part of its economic development, Abu Dhabi is eager to develop downstream industries. Cepsa, a refiner with 1,750 service stations in Spain and Portugal, also has petrochemical, gas distribution and power subsidiaries. The acquisition will give Abu Dhabi additional processing capacity for its 2.4 million barrels per day of crude oil output. 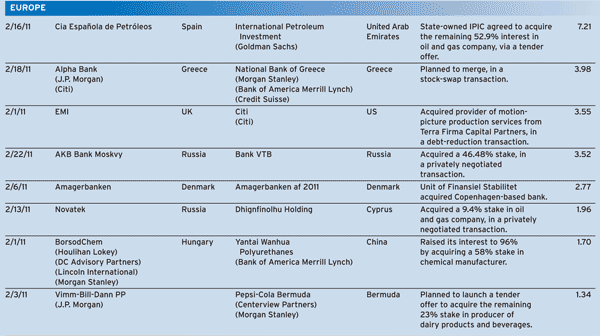 In February, Chevron sold its Spanish fuels, finished lubricants and aviation businesses to Cepsa. In February 2009, IPIC spent $2.3 billion, including the assumption of debt, to acquire Nova Chemicals, the largest plastics producer in Canada. In another recent major energy transaction, BP agreed to acquire a 30% stake in 23 oil and gas blocks from India-based Reliance Industries for $9 billion. With exploration drilling still closed in the US following last year’s oil spill in the Gulf of Mexico, BP is looking for other regions in which to drill. The UK-based oil company plans to sell its US refineries and to concentrate on emerging markets. The Reliance Industries deal came a month after BP announced a $10 billion deal with Russian state-energy company Rosneft for oil exploration in the Arctic Ocean. BP already has considerable experience in India. Since 2008 it has been working with Reliance on a deepwater block off the east coast of India. BP also owns 71% of Castrol India, the market leader in India’s retail automotive lubricant business. In the financial services sector, proposed mergers of major stock exchanges around the world continued to grab the headlines. 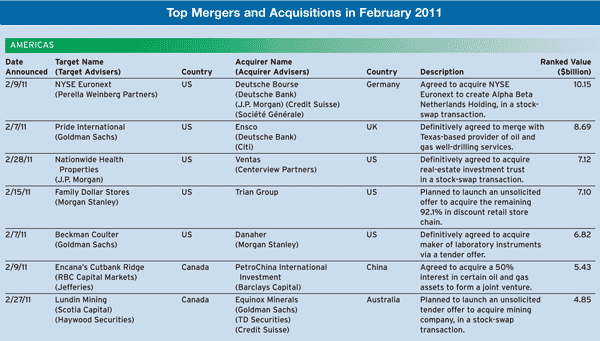 There also are a number of significant bank mergers in the works. In Greece, where the government has strongly urged banks to merge, National Bank of Greece made an unsolicited all-share offer, valued at about $4 billion, for Alpha Bank. The offer was quickly rejected, with Alpha Bank citing the uncertainties of the current environment and stating that the terms of the offer were unfavorable to its shareholders. In Russia, Bank VTB acquired a 46.5% stake in AKB Bank Moskvy, also known as Bank of Moscow, with an ultimate goal of acquiring 100% of the bank’s shares. Bank of Moscow is the core bank of the City of Moscow’s administration and was closely associated with Moscow’s former mayor Yuri Luzhkov, who was dismissed last September.